Looking at Twitter this week someone asked if people honestly watched musicals for the plot, and whether complaining about a lack of narrative is appropriate since audiences are lying in wait for the dancing anyway. I’ve criticized my fair share of musicals for absent plot before and many musicals capably balance narrative and music at the right tempo. But then you hit on a musical the Tweet could have been about, and you understand; Springtime in the Rockies is that type of musical, one with enough plot to keep things focused, but whose Technicolor whimsy and dance sequences sell the picture. Vicky Lane (Betty Grable) and Dan Christy (John Payne) are Broadway’s best couple, but Dan’s philandering leaves Vicky fed up. Without a job to his name Dan’s only hope is getting Vicky back on-board for another performance, but she’s up at Lake Louise with her new paramour Victor Prince (Ceasar Romero). Dan’s only hope is to go to the Rockies and woo Vicky back into the show, no matter what! 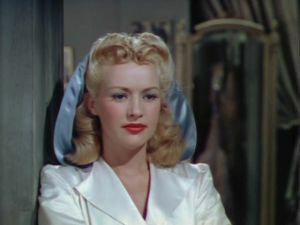 Springtime in the Rockies is what I expected from The Gang’s All Here (1943): a Technicolor feature with music, dance and a beating heart that shines through its characters. After the opening credits Bewitched stole and slapped their name over, we meet Vicky and Dan – two Broadway hoofers that only exist in movies, whose hatred of each other acts as an aphrodisiac for their endless love. Fred and Ginger could have easily played these characters (if they haven’t already). Dan’s a womanizing cad and Vicky is rightfully irritated at him, ending their relationship, both personal and professional. Reminiscent of Jimmy Stewart, Payne’s Dan naturally trips his way through life. We know he has a problem with the ladies, but there’s no malicious grin behind it and any issues after the opening stem from a desire to make Vicky jealous. When he hides behind Vicky’s curtains as she talks to Victor, Dan could turn the audience against him – he makes no bones about smoking a pipe while hiding – but the entire sequence is funny because Dan and Vicky are in this mess together. Director Irving Cummings, well-regarded for musicals (and the helmer of another Miranda vehicle, Down Argentine Way), creates a musical that involves music but doesn’t overburden the audience, or the film, with it. The musical numbers diagetically work within the narrative frame. So there aren’t moments where the film abruptly stops to sing a number, instead presenting sequences to introduce Vicky and Dan’s routine. This isn’t an Esther Williams movie – no offense, Es – where half the film is just performances, and that’s despite Harry James presence (Grable’s then-husband) and his music makers. And while the musical numbers aren’t as ambitious as those in a Busby Berkeley film – they lack choreography, more costume-ography – they’re ear-catching. And they’d have to be considering that, though this may be titled “Springtime in the Rockies” the only taste of the Rockies we get are the painted background the group dances in front of. I mentioned Alice Faye, a replacement for Betty Grable, was wooden during The Gang’s All Here, and I’m far and away a Betty Grable fan. Grable’s face is so unique in itself and was made for Technicolor! She’s effortless, with a warm, honeyed performance attuned to the film she’s making. Watch her play off Romero in the final scene, whispering “I love you” with a mix of fear and possibly shame, and you’ll understand her comedic timing. She’s a more glamorous Jean Arthur, an heiress coming down to our level to tell a funny. Springtime in the Rockies is far from a work of art, nor is it a technical master in the music department, but for a Fox musical it gets the job done. It cares about how the story and characters are presented and the acting lives up to the film itself. Interesting side note, in the dancing sequences of The Gang’s All Here the studio used the costumes for this film. I recognized the ones used in the closing act by the background dances in Springtime right away.